You'll be £6.00 closer to your next £10.00 credit when you purchase German Armour Lost in Combat on the Eastern Front. What's this? If you are looking for panzer wrecks then these two books will be up you alley. There is a good variety of vehicles in each book so there should be something for everyone. Recommended - Read the review online here. Offers a vivid illustration of how armored vehicles are susceptible to enemy fire, a subject that will appeal to many, especially modellers. A first-hand documentation for researchers and historians, for the modeller specialized in the construction of scale combat vehicles, vignettes or dioramas, and for the amateur in general. A good selection of archive photos, and with helpful captioning. ​Read the complete review here. 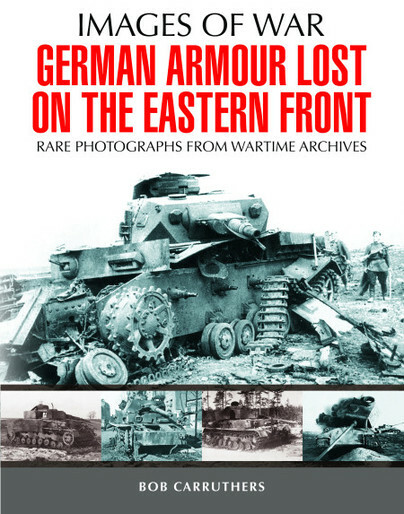 Pen and Sword have released another truly outstanding text in their Images of War series; German Armour Lost on the Eastern Front. An outstanding photographic study and written material authored by Bob Carruthers, the book is a fine examination of German circa 1941-1945. As a stand-alone photo expose the material is superb, excellent clarity throughout and a spread of examples and types of which I have never seen before. A great deal of the late war period armor has added improvements which are rarely seen anywhere else. A fact that makes the book a must have for avid tank enthusiasts and those who scale model and desire accurate images that existed in the field. The photo line-up is simply brilliant containing a depth that is consistent throughout. Carruthers adds short and to the point detail in his captions which add great flow and readability to the material. From a military historians point of view I found the evidence within to illustrate an exceptional review of what the German Offensive of 1941 began with on the ground. The early models are well covered and show the development of the state of German armor design and production from that period. The transition period which began when the German war machine ran headlong into not only the depth of the PAK fronts but the T-34 and KV-2 is also well documented here. For an enthusiast of the Porsche Ferdinand Model one will have a field day with its extensive coverage. The mid to late war period produces some of the finest points of the war and there are a number of aspects to be gleaned from this fresh and exciting material. Not to give away all the books gems I suffice it to say that there is a wealth of information which has been well researched and compiled here that well worth your investment. Bob Carruthers; as with The Wehrmacht in Russia again has produced a stellar armor study unlike anything currently existing. There is a great deal to this book that makes it highly recommendable; the coverage and depth of the German tank inventory alone is stellar. The capturing of extensive Russian field information which is included although not highlighted but yet captured in the photo is excellent. The varied terrain and background areas include both open field, depot and urban warfare examples and the range from 1941 through to 1945 takes you upon a wide ranging geographic study itself. Modeling experts will get a huge amount of value from this book, it is full with fine examples and camouflage schemes and variants, as well as added touches from tankers in the field. I highly recommend this work as a must have for both the Second World War reader and history specialists, and a real must have for the scale modeling fan. This addition to the very popular Images of War series provides images of German tanks killed on the Eastern Front. The huge area of the Eastern Front made ideal country for massive tank battles and loses were equally enormous – Very Highly Recommended. From 2012, Pen and Sword Digital will be providing viewers with a brand new selection of films (and books) from Coda Books. Split into two series, Hitler’s War Machine and World War II From Primary Sources, they will give readers a chance to see the original footage from the events of the Second World War, as well as original propaganda material and films used by both sides during the conflict. Bob Carruthers is one of the UK’s leading military historians and is famous in the UK for the bestselling book The Wehrmacht in Russia, published by Pen & Sword, which topped Amazon bestseller charts in 2012. Bob is also an Emmy AwardTM winning filmmaker whose work in the form of series such as Battlefield, Line of Fire, and Weapons of War are channel staples that are shown on BBC, Channel 4, Discovery, PBS and numerous other channels around the world.